- Bharat Lele Among all the millions of Gods and Goddesses in the Hindu mythology, the elephant-headed God Ganpati is one of the most loved and revered and completing the Ashtavinayak Yatra every year since the past 12 years is a matter of joy for me and my fellow riders. The Ashtavinayak Yatra route map (Photo: ashtavinayak.info) To provide with a basic idea of the Ashtavinayak Yatra for those who are unaware, this Yatra involves a visit to the eight ancient holy Ganesha temples spread across Maharashtra. The speciality of the Ashtavinayak is such that the idol in each temple is different from one another and the trunk is distinct too. There is no doubt on the thrill that riding provides, but it comes with a certain amount of responsibility. We have seen and been in a lot of incidents that have taught us a good lesson that there is no option to taking special efforts for our safety. So as a Rider or a Pillion, we always ride with Riding Safety Gears; wearing helmet is obligatory and riding gear is additional safety. Remember to drink a lot of water when you are riding. While on road, have less food since the constant movement may give you an uneasy feeling with a very full stomach. Have stomachs full at night. Last year we started our journey on December 26 early morning at 5 AM. We were six of us with three bikes; 2 Royal Enfields and 1 Apache 180. Buffalo festival (Photo: Bharat Lele) Following Vigneshwara at Ozar, we started riding towards Mahaganpati at Ranjangao, a journey of about 75 kms away. This leg of the journey is a little tiring since it is covered in the afternoon and it is the second largest patch between Vighneshwar and Mahaganpati. On one of our previous years, we lost our way and landed in a village where a Buffalo Festival was underway. We had to take our bikes through dead corners of the road that could have made us fall in a big pit if we missed out on the slightest concentration. Now turns out, the right route to Ranjangaon was actually a tiny sand trail and full of rubble. We finally made it to the temple at 3:30 PM and running out of schedule. Moreover, there was a queue for over 600 devotees. We were further surprised when we were told that our belongings, including the mobile phones were to be kept in unguarded lockers. To avoid taking chances, we decided to go in batches of three. All this aftermath ultimately led us to take three hours for the Darshan. In recent years, the temple at Ranjangaon has become commercial in nature and thus one can see long queues and a lot of money. A lot of finance has been pumped into the main temple (gabhara) too. But the temple loses the old charm of the Ashtavinayak. 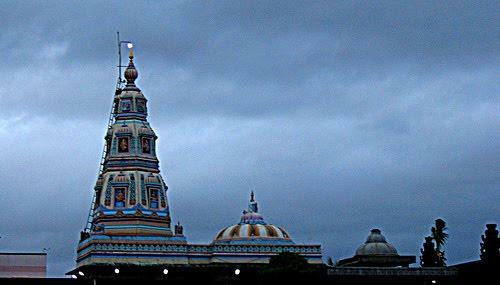 4) Siddhivinayak at Siddhatek. Siddhatek is about 82 kms from Ranjangaon. It is now safe to travel at any given time of the day except that that the road is quite small and if it is dark then one needs to be careful of the tractors since a lot of Sugar factories are located around here. We travelled through in the evening and owing to a cooler climate, we managed to reach there by 7 PM. We did hustle a bit and there were no stops taken after starting from Mahaganpati so we could manage to reach in 2 hours. (Photo: wheresmypandit.com) It wouldn’t be wrong to call Siddhatek as one of the most undeveloped villages in the Ashtavinayak Yatra. With no commercialisation and less crowd, we made a quick exit from the Siddhvinayak temple. The Darshan took all in 20 minutes. We took another quick short snacks break after this and had refreshing sugarcane juice and corns that made us all set to start off towards Morgaon. 5) Mayureshwar at Morgaon. (Photo: Sankashti.com) As per our plan, Morgaon was our last stop for the day and we had planned to stay here for the night. We started from Siddhatek at around 8 PM. Although two of our riders were fatigued, we had strict instructions to make it to Morgaon since Siddhatek was not equipped for good accommodation and we would have then lagged in our schedule a lot. So we started the 70 Kms journey and decided to take no stops in between. Unfortunately my Bullet started showing some alarm signs. It started losing power all of a sudden and made our pace drop a lot. We could manage to reach Mayureshwar temple at 10:30 PM. I would want to make a special mention here that even though the bike was new, a Rider must know that it’s a machine and anything can happen at any time. Precisely the same happened to me right then. After a day of riding and disrupted schedule we barely managed to get a single room for 6 people in a hotel. We were baring the December cold of the interior Maharashtra and all of us were shivering through our bones. The riding gear helped us a little to bare the cold but it was particularly enough. A hot dinner served at the hotel put the life back in us and we ultimately slept at 1 AM to start out at 5 AM in the morning. Bharat walks in a corporate suit on weekdays and a rider’s gear on weekends. This SAP consultant has several ultra-long-distance bike rides to his profile. Not only has he covered the entire Ashtavinayak journey in Maharashtra on a bike but also completed a trip to Shegaon, 550 kms from Thane, within only 18 hours. He has also completed a journey from Thane to Leh on bike.